This page is for discussion of climate science in general not covered by other threads. I write to announce my employment with my publishers, Suite101 was terminated today without prior notice or explanation and all my articles published over a two-year period with them are now removed from the Internet. 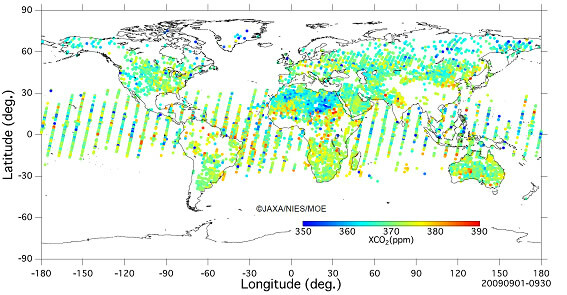 I believe this is in retaliation for my latest article ‘New Satellite Data Contradicts Carbon Dioxide Climate Theory’ revealing the shocking fact that the Japanese ‘IBUKI’ satellite measuring surface carbon dioxide emissions shows that Third World regions are emitting considerably more CO2 than western, industrial nations. It appears a self-serving and influential clique of zealots, fearful that the story may go viral, is desperate to kill it. This morning my Suite101 article had already gotten over 400,000 crosslinks a mere two days after publication. This evening a Google search shows that number cut to 297,000; so much for free speech and easy access to information on the Internet. It appears that one of the outlets for his articles, Suite101.com, has finally noticed his tenuous connection with reality and removed all his posts. The real pity is that they allowed them on their servers in the first place. I wonder if Treadgold will run that bit of news as well? GR hasn’t got a clue. He thinks Ibuki/GOSAT is “really talking about” reducing estimation error of ground observations and cites H. Takagi et al — “a rather technical read, to be sure, and not at all the thing for bedtime reading” (all of 4 pages counting References). But that paper is just a spin-off from the project titled “On the Benefit of GOSAT Observations to the Estimation of Regional CO2 Fluxes”. It’s no different to using satellites for any other metric that is also measured by ground stations e.g. GAT and reducing estimation error (or introducing more – whatever the case may be). (Note 2) Southern Hemisphere values were on average approximately 17 ppm lower than the model calculation, while Northern Hemisphere latitude band average values were approximately 7-12 ppm lower. The evil emitters seem to be Northern China, Central India and North-Central Africa. Shame on them. The most heinous CO2 emitter on the planet seems to be a secret Australian fossil fuel installation in the Great Victoria Desert on the WA-SA border. Where’s James Bond when you need him? Ah, Gareth Renowden, our local champion of free speech. But only his own. Not an inspiring hero, is he: “the real pity is that they allowed them on their servers in the first place”? What the hell are you afraid of, Gareth, you jellyfish — someone pointing out the flaws in your climatic fantasies? Someone suggesting (perfectly reasonably) that no ETS in Kiwiland will change the climate anywhere? Someone stating as a fact that closing down the entire NZ economy and requiring each of our 4.4 million people to subsist on what they might find or grow in their own neighbourhood will go spectacularly unnoticed by the global climate? That’s only using the IPCC’s view of things, which is that carbon dioxide is the supreme driver of weather. Or are you afraid of something else? Like not making enough money out of this lovely climate rort? Selling carbon footprint certificates, perhaps? But I digress. Why wouldn’t I run that story? It highlights yet another injustice against those whose only crime — listening? Whose ONLY crime — is to be sceptical of alarmist claims made about global warming and to ask for evidence. Which is no crime at all. Sure, I’ll run it, Renowden. Why ever not? Do you even follow what is going on beyond anything that serves your agenda. Have you even looked, or even thought about, the physical implications of the energy loss that the cold PDO creates to the entire climate system? DO YOU EVEN LOOK AT THE RECORD COLD MID TROPOSPHERIC TEMPERATURES, ESPECIALLY 400 MB WHERE THE TRAPPING HEAT WAS SUPPOSE TO SET OFF THE TIPPING POINT FEEDBACK, AND ASK HOW CAN RECORD COLD BE GOING ON HERE IF ALL THIS IS A SIGN OF WARMING? How can we cool the central tropical Pacific, and then the atmosphere above, and then come to the conclusion that warmth is occurring and leading to the perceived increase in extremes. If defies all logic of any rational, free thinking person, yet alone scientist. You need to explain this, and also need to tell us if you even look at these things. I can not believe you have watched these levels and it not present a major challenge to your thinking on this! The fact is: Human-caused climate change has increased the odds of extreme, even unprecedented weather events. Senior scientist Jerry Meehl of the National Center for Atmospheric Research (NCAR) puts it this way, “Just as steroids make a baseball player stronger, and increase his chances of hitting home runs, greenhouse gases are the steroids of the climate system.” So in the case of climate, the extra juice (greenhouse gases, not performance-enhancing drugs) doesn’t result in more home runs but in the greater likelihood that heat waves and other forms of extreme weather will occur. If the heat is where Spencer says it is and where our radiative transfer models say it is, we lose our funding. More likely a bunch of lower density warm water sank to the bottom of the ocean – undetected by sensors on its way down. The trend is especially strong in the southern hemisphere. Dravitzki, S. and McGregor, J. 2011. Extreme precipitation of the Waikato region, New Zealand. International Journal of Climatology 31: 1803-1812. The authors write that “Trenberth (1999) proposed that globally, extreme precipitation events would account for a larger proportion of annual precipitation as the globe warmed,” as was additionally suggested by Trenberth et al. (2003). And they state that “this is also supported by the fourth IPCC report (IPCC, 2007),” which “expects the change in the intensity of precipitation events to be proportional to changes in total precipitation.” Thus, they decided to see if any of these projections have occurred over the past century or more in New Zealand’s Waikato region, which is an important farming district that also produces 13% of the country’s electricity by means of hydro-generation. Working with data from 18 meteorological observation stations located in and about the Waikato region, Dravitzki and McGregor developed daily precipitation time series covering the period 1900-2007, where they averaged the precipitation values, as they describe it, “both spatially and temporally to approximate the total volume of precipitation within the region,” and where they defined heavy precipitation statistically, using 95th and 99th percentile threshold values, in order to be “consistent with the IPCC climate indices of precipitation extremes,” while they also looked for any relationships that might exist between extreme precipitation events and the Interdecadal Pacific Oscillation (IPO), the El Niño-Southern Oscillation (ENSO) and the Southern Annular Mode (SAM), which relationships have been suggested by others in the past. In discussing their findings for the Waikato region of New Zealand, Dravitzki and McGregor write that “the consistency of the precipitation totals suggests that the current economically important water supply is secure within the region.” And we would add that their finding of no evidence for the projections of Trenberth and the IPCC over a 107-year period — when climate alarmists claim the world warmed at a rate and to a level of warmth that were unprecedented over the past millennium or more – suggests that the projections of Trenberth and the IPCC are not what they are cracked up to be, at least for this important part of New Zealand. Another tenet of AGW theory bites the dust in the face of real-world data: AGW theory proposes that increased CO2 levels lead to increased water vapor in the atmosphere (despite empirical data which shows the opposite) and therefore supposedly lead to increased rainfall in most regions. A paper published today in the Nature Climate Change February 2012 edition studied rainfall over the Indian subcontinent 1813-2006 and finds rainfall has decreased since the 1930s as CO2 emissions markedly increased with industrialization. The data instead shows a natural, cyclical variability in mean annual rainfall that peaked in the 1870s and 1930s with absolutely no correlation to levels of CO2. 1. Southern African rainfall. Avoid this one – and indeed avoid pretty much all climate indicators related to precipitation. The large natural variability of precip. makes it very hard for a human-induced climate change trend to be picked up. A paper published today in the Journal of Climate finds that relative humidity has been decreasing 0.5% per decade across North America during the 62 year period of observations from 1948-2010. Computer models of AGW show positive feedback from water vapor by incorrectly assuming that relative humidity remains constant with warming while specific humidity increases. The Miskolczi theory of a ‘saturated greenhouse effect’ instead predicts relative humidity will decrease to offset an increase in specific humidity, as has just been demonstrated by observations in this paper. The consequence of the Miskolczi theory is that additions of ‘greenhouse gases’ such as CO2 to the atmosphere will not lead to an increase in the ‘greenhouse effect’ or increase in global temperature. Over 1/4 billion hourly values of temperature and relative humidity observed at 309 stations located across North America during 1948-2010 were studied. The water vapor pressure was determined and seasonal averages were computed. Data were first examined for inhomogeneities using a statistical test to determine whether the data was fit better to a straight line or a straight line plus an abrupt step which may arise from changes in instruments and/or procedure. Trends were then found for data not having discontinuities. Statistically significant warming trends affecting the Midwestern U.S., Canadian prairies and the western Arctic are evident in winter and to a lesser extent in spring while statistically significant increases in water vapor pressure occur primarily in summer for some stations in the eastern half of the U.S. The temperature (water vapor pressure) trends averaged over all stations were 0.30 (0.07), 0.24 (0.06), 0.13 (0.11), 0.11 (0.07) C/decade (hPa/decade) in the winter, spring, summer and autumn seasons, respectively. The averages of these seasonal trends are 0.20 C/decade and 0.07 hPa/decade which correspond to a specific humidity increase of 0.04 g/kg per decade and a relative humidity reduction of 0.5%/decade. Using data from 1958 and mathematical techniques that haven’t been widely used in the field, scientists took the amount of emissions and subtracted what was retained in the atmosphere and what the oceans took up, leaving the land component for the study. They noticed the abrupt shift in 1988, when the intake of 0.3 billion tonnes of carbon per year surged to one billion tonnes. Kevin Tate, research associate at Landcare Research, said he was ”intrigued” by the findings. If phytoplankton respond like most plant species do, we may find that the modest increases in CO2 levels we have experienced over the last 50 years may actually create a bounty of micro plant growth in the oceans, which would in turn create the food supply necessary to support an increase in the oceans’ animal population. At the same time, it would explain where the excess atmospheric CO2 has been going; much of it converted into additional biological matter, with only a limited existence as raw CO2. Any views on the credibility/appropriateness of these parameters? RE revisions are detailed in Myhre et al 1998 that are determined by.LBL model, NBM model and BBM model. We need to be VERY careful with units and state when necessary e.g. Radiative efficiency of CO2 from Chap 6, 6.12.2 is 0.01548 Wm−2 ppmv−1. Note that these two values are NOT directly comparable as they stand in those units. But I could be wrong on that – suggest you check this out carefully. Yes I got the units sorted some time ago. I have just been accepting that the use of RE is appropriate and accepted science and wanted to know whether thinking has moved on at all. Will get into those refs over the weekend. Richard C, you know more about this than I do. Jim does, too! Could you comment when you get a minute on the relative merits of Thayer Watkins’s site Saturation, Nonlinearity and Overlap in the Radiative Efficiencies of Greenhouse Gases and Water Vapor Rules the Greenhouse System at Geocraft.com? Also, Geocraft gives water vapour’s relative contribution to the “greenhouse effect” as 95.000% and carbon dioxide’s as 3.618%, which seems to make WV about 26 times more effective than CO2. Which is orders of magnitude away from 60%. What do you think? Geocraft gives water vapour’s relative contribution to the “greenhouse effect” as 95.000% and carbon dioxide’s as 3.618%, which seems to make WV about 26 times more effective than CO2. I think this is reasonable given the references for the figures as long as it’s not taken as hard-and-fast (“about” as you say). As numerous experts and laymen (myself) continually point out, this is easily demonstrated using the dry Sahara – humid Singapore example. Which is orders of magnitude away from 60%. What do you think? Be careful to make like-for-like comparisons here, I think you might be using radiative efficiency (RE) for your 60% figure as in Watkins’ “the radiative efficiency of water vapor is fifty to sixty percent greater than that of CO2” but Geocraft’s Table 3 is “Relative Contribution to the “Greenhouse Effect””. Radiative efficiency and relative contribution are two very different concepts. The first is a term in a parameter of the Beer Lambert Law, the second is nominal relative quantities. Ah. The contribution of each gas is weighted by its relative abundance. Naturally. Thanks. Now the Thayer Watkins article. I can’t identify anything untoward where he works through the saturation, nonlinearity and overlap situations. I can’t recall any dispute elsewhere of what he covers either. #2 GWP is a weird construct that sets CO2 to 1 and all others relative to it. This presupposes that the workings for CO2 are rock solid because if it’s out, so are all the others. Andy is bothered with it (GWP) because he has not found how methane gets set to 23 x CO2. That might be in Myhre et al somewhere and we might get around to nailing it down someday. “The questions call for a numerical answer [for water vapour]. Global Warming Potential (GWP) is a technical term widely used in the literature on global warming. The babbling answers suggests that the numerical value is not readily available even to people who are specialists in global warming. This ignoring of the technicalities of the role H2O in the climatology of the Earth is mind boggling”. I’ve just read Myhre et al again and it ONLY deals with radiative forcing (RF) revisions. It does NOT deal with radiative efficiency (RE), I had my wires crossed thinking there was something in there about RE. Neither does Myhre go into GWP at all. where TH is the time horizon over which the calculation is considered, ax is the radiative efficiency due to a unit increase in atmospheric abundance of the substance in question (i.e., Wm-2 kg-1), [x(t)] is the time-dependent decay in abundance of the instantaneous release of the substance, and the corresponding quantities for the reference gas are in the denominator. The GWP of any substance therefore expresses the integrated forcing of a pulse (of given small mass) of that substance relative to the integrated forcing of a pulse (of the same mass) of the reference gas over some time horizon. The numerator of Equation 6.2 is the absolute (rather than relative) GWP of a given substance, referred to as the AGWP. The GWPs of various greenhouse gases can then be easily compared to determine which will cause the greatest integrated radiative forcing over the time horizon of interest. The direct relative radiative forcings per ppbv are derived from infrared radiative transfer models based on laboratory measurements of the molecular properties of each substance and considering the molecular weights. Updated information since the SAR is presented for many gases in Section 6.3. Many important changes in these quantities were recently reviewed in WMO (l999) and will be briefly summarised here. In addition, some gases can indirectly affect radiative forcing, mainly through chemical processes. For example, tropospheric O3 provides a significant radiative forcing of the climate system, but its production occurs indirectly, as a result of atmospheric chemistry following emissions of precursors such as NOx, CO, and NMHCs (see Section 6.6 and Chapter 4). Indirect effects will be described below for a number of key gases. It is important to distinguish between the integrated relative effect of an emitted kilogram of gas which is represented by a GWP and the actual radiative forcings for specific gas amounts presented, for example, in Section 6.3 and in Figure 6.6. GWPs are intended for use in studying relative rather than absolute impacts of emissions, and pertain to specific time horizons. The radiative efficiencies ar and ax are not necessarily constant over time. While the absorption of infrared radiation by many greenhouse gases varies linearly with their abundance, a few important ones display non-linear behaviour for current and likely future abundances (e.g., CO2, CH4, and N2O). For those gases, the relative radiative forcing will depend upon abundance and hence upon the future scenario adopted. These issues were discussed in detail and some sensitivities to chosen scenarios were presented in IPCC (l994). A key aspect of GWP calculations is the choice of the reference gas, taken here to be CO2. In IPCC (l994), it was shown, for example, that a particular scenario for future growth of CO2 (S650, see Chapter 3) would change the denominator of Equation 6.2 by as much as 15% compared to a calculation employing constant pre-industrial CO2 mixing ratios. The atmospheric response time of CO2 is subject to substantial scientific uncertainties, due to limitations in our knowledge of key processes including its uptake by the biosphere and ocean. When CO2 is used as the reference, the numerical values of the GWPs of all greenhouse gases can change substantially as research improves the understanding of the removal processes of CO2. The removal function for CO2 used for the GWPs presented here is based upon carbon cycle models such as those discussed in Chapter 3. The CO2 radiative efficiency (ar) used in this report has been updated since the SAR, as discussed in Section 6.3 (see below). The lifetimes of non-CO2 greenhouse gases are dependent largely on atmospheric photochemistry, which controls photo-lysis and related removal processes as discussed in Chapter 4. When the lifetime of the gas in question is comparable to the response time of CO2 (nominally about 150 years, although it is clear that the removal of CO2 cannot be adequately described by a single, simple exponential lifetime; see IPCC (l994) and the discussion below), the GWP is relatively insensitive to choice of time horizon, i.e., for N2O. When the lifetime of the gas in question differs substantially from the response time of the reference gas, the GWP becomes sensitive to the choice of time horizon, which in turn implies a decision regarding the climate processes and impacts of interest, as noted above. For longer time horizons, those species that decay more rapidly than the reference gas display decreasing GWPs, with the slope of the decay being dependent mainly on the lifetime of the gas in question. Gases with lifetimes much longer than that of the reference gas (e.g., C2F6) display increasing GWPs over long time horizons (i.e., greater than a hundred years). We emphasise that the GWP is an integral from zero to the chosen time horizon; hence the values presented in the table for 25, 100, and 500 years are not additive. Note at top of page that “The formulation of GWPs, reasons for the choice of various time horizons, and the effects of clouds, scenarios, and many other factors upon GWP values were discussed in detail in IPCC (1994)“. Table 6.7: Direct Global Warming Potentials (mass basis) relative to carbon dioxide (for gases for which the lifetimes have been adequately characterised). As in previous reports, here we present GWPs for 20, 100, and 500 year time horizons. The most recent GWP evaluations are those of WMO (l999) and the SAR, and the results presented here are drawn in large part from those assessments, with updates for those cases where significantly different new laboratory or radiative transfer results have been published. The sources used for input variables for the GWP calculations are indicated in this section and in the headers and footnotes to the tables, where sources of new estimates since the SAR are identified. So looks like it’s back to SAR in combination with sources “in this section and in the headers and footnotes to the tables”. Sigh, what a mission. I get Not Found Error 404 Jim. Found here at The Alliance for Responsible Atmospheric Policy http://www.arap.org/adlittle/appendixb.html Worth browsing through this report. About the Alliance http://www.arap.org/about.php Focus is HCFCs and HFCs and the Membership List seems to be all the big industry players. WMO 1999 is no use for our purposes so can discard and look at SAR. SAR refers to the book: IPCC, 1994: Climate Change 1994. Radiative Forcing of Climate Change and an Evaluation of the IPCC IS92 Emissions Scenarios. “IPCC 1990” is FAR so I should have gone there in the first instance. Chapter 2 of FAR has 2.2.7 A Global Warming Potential Concept for Trace Gases on page 58 text.and pdf. This has all the references we need but another day for this, there’s only so much IPCC guff I can take at a time. The calculation is (RE CH4/Mass CH4) x Decay function of CH4, divided by the same calc for CO2. This formula was from a teaching model left by mistake on Wikipedia since removed. There are clearly a number of issues that arise. The appropriateness of comparing two very different gases. The concept of Pulse Model is clearly inappropriate now that Methane is nearer Steady State and OH radicals have been found to be very resilient. Without any contrived IPCC adjustments Methane GWP using their dubious methodology is 6.4. Thanks Jim. I have bookmarked this and will come back to it when I get time. Acknowledged too Jim. I’ve only been searching the provenance and development of the methodology so until I’ve read FAR and it’s references linked above that everything leads back to, I can only comment from limited background. I realize that indirect effects are detailed in TAR but why (if I’ve got this right) do the IPCC term GWPs that are indirect effect adjusted as direct GWPs? Seems to me that 23 is Direct + Indirect 1 + Indirect 2 + Indirect 3 i.e. a Cumulative Indirect Effect Adjusted GWP. Basically I think the initial group manipulated the time in atmosphere for 7.25 yrs to 12.83 years as above and produced the GWP of 11.3. I then think that the formula was essentially locked away. In the form I found it in a US University Chemistry course it was considerably less approachable that the unbundled version above. Later ‘Researchers” then took the GWP number and competed in the TAR over hypothesising further corrections they could make to the GWP number without revisting the basic calculation. Sounds crazy but there are the numbers. With inputs of 3.7 x 10-4 and adjusted lifetime of 12.0 years the GWP calculates to about 11 slightly different from above. No don’t agree with this, there’s another reason not to drop RE and that is that in TAR equation 6.2 for GWP(x) http://www.grida.no/climate/ipcc_tar/wg1/images/equ6-2.gif found in 6.12 Global Warming Potentials 6.12.1 Introduction, ax is the radiative efficiency due to a unit increase in atmospheric abundance of the substance in question (i.e., Wm-2 kg-1) and ar is the reference. RE (ax) with units (Wm-2 kg-1) is peculiar to climate science and the reason that IPCC REs can ONLY be used for GWP calculations. The parameter a is the product of two terms. One is the concentration ρ of the absorber and the other is a characteristic of the absorber α, called its radiative efficiency. In this paper, Cherubini et al http://www.societalmetabolism.org/aes2010/Proceeds/DIGITAL%20PROCEEDINGS_files/PAPERS/O_186_Francesco_Cherubini.pdf you can see in Equation (0.2) how climate science calculates the radiative efficiency (α) of CO2 as per Forster et al., 2007 (which is a contribution to AR4 WGI) or at least they say it is. Where [CO2] is the concentration in the atmosphere after small perturbation and [CO2*] is the initial concentration of CO2 in the atmosphere. These are concentration terms, not mass terms. So the change in forcing (ΔF) of CO2 “as a function of changing concentration” is no different to the radiative efficiency (α) of CO2 as a function of changing concentration, i.e. αCO2 = ΔF CO2. It could be though, that Cherubini et al has the wrong calculation for αCO2. I am getting a bit lost with the arguement around RE and mass. What I have been focusing on is replicating the IPCC calculation as per the formula above as I have not seen this published before and everyone has been bandingly around all sorts of numbers and arguements. Once that is accepted there is a separate debate to be had around its reasonableness. I’m a bit lost with the GWP formula. Is your formula a simplification, rearrangement or alternative to the GWP(x) 6.2 formula from TAR? Where TH is the time horizon over which the calculation is considered, ax is the radiative efficiency due to a unit increase in atmospheric abundance of the substance in question (i.e., Wm-2 kg-1), [x(t)] is the time-dependent decay in abundance of the instantaneous release of the substance, and the corresponding quantities for the reference gas are in the denominator. Yes Jim, mass is in your formula but it’s not in IPCC TAR GWP(x) 6.2. Also 6.2 is an integration with respect to time (dt) in both numerator and denominator but yours is not. Decay functions occur in both yours and 6.2 but are included in the integrations of 6.2. (numerator and denominator) whereas yours are cumulative adjustments to an initial calculation. I think what you have is an approximation of 6.2 or alternative calculation that returns the same values by some quirk but I don’t see how it can be a rearrangement. The term “radiative efficiency” does NOT occur. What is referred to in TAR, Wiki etc as “radiative efficiency” (α) is merely “instantaneous radiative forcing” (a) in FAR. This tallies with my assessment that αCO2 = ΔF CO2. and that (α) has NOTHING to do with the conventional concept of efficiency (η). No “radiative efficiency”in there. I think we can forget about the unconventional “radiative efficiency” along with it’s phony symbol (α) being anything more than just the same old “radiative forcing” with a different name. Richard, think you are testing me. The TAR was written by a committee as a summary document and is full of inconsistencies and various views on the adjustments required. I doubt very much that you could replicate a GWP calculation solely from the Tar – indeed that is why no one outside IPCC has done so. I agree that the cummulative adjustments to the initial calculation are not science just IPCC politics but the alternative would have been to create an improbably long atmospheric life time for CH4 (27 years). Happy to provide the original model from Chemistry Dept Hope University MI I unbundled if you are interested. The calculation above also works fine for NO2 so this is not a co-incidence. That “The calculation above also works fine for NO2 so this is not a co-incidence” is what has got me flummoxed. I cannot determine the provenance of your formula to the same degree even though it seems to come up with the same values – this is really curious. Andy if you see this, can you explain why these two different mathematical expressions return the same values. You are NOT using the IPCC GWP expression. The IPCC GWP expression here http://www.grida.no/climate/ipcc_tar/wg1/images/equ6-2.gif does NOT make “cumulative adjustments to the initial calculation”. It is your formula that does that Jim, not the IPCC’s. 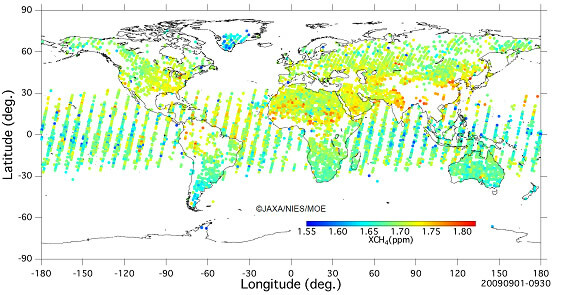 The greenhouse warming potential is a relative measure of the capacity of a specific chemical species to trap infrared radiation as heat in the Earth’s atmosphere, and is a scale that has been used to establish regulatory strategies for the reduction of greenhouse gas emissions. A model is described that allows a straightforward, spreadsheet-based determination of greenhouse warming potentials from the infrared spectra of atmospheric gases. On the basis of the numerical results of the model, students are able to investigate the molecular properties that are characteristic of greenhouse gases and thus are able to understand the rationale behind the recent agreement by the world’s industrialized nations to reduce certain greenhouse gas emissions. Equation (3) on page 2.
atmospheric lifetime in years for the GHG and CO2, respectively. Yes I thought over night I should point out the use of EXP being a standard excel function (exponential) used in my calc. So where have we got to. Are you happy with the model above? If you set up a working spreadsheet it becomes obvious that there had to be post calculation adjustments. Please don’t lead me on a wild goose chase like this ever again when you could easily have shortened the process considerably by A and B – life is too short. Yes I am satisfied with the model because now I can see its basis in Elrod’s paper (mass), it’s provenance (IPCC FAR via Seinfeld et al), the formula and why it was different to TAR 6.2, modifications and simplifications to it by Elrod, and the parameters. The decay adjustments are documented in TAR so that’s where I’ll go for those. I’m not set up for Excel at the moment (long story, I’ll get it back one day) but I did load the model into Google Docs spreadsheet to have a look. I couldn’t use it as I would Excel but I could see what it is all about. I’m more interested in the historical development and evolution of GWP to be honest and my discovery that αCO2 = ΔF CO2 (RE = delta RF). Andy will probably look at the paper and spreadsheet eventually now that we have access to it. I stumbled across a WMO report on their website while researching the provenance of GWP. implications for policymaker use of such a tool will be approached cautiously. TAR WGI were considering a tool that would “possibly replace” GWPs. Well I beg your pardon -that was certainly not my intention. I posted the spread sheet model to Google docs which referenced Elrod but you were not able to pick it. I wrongly assumed the excel format I gave would be self explainatory. Incidentally I have been trying to get this reviewed for about 2 years so thanks for making the effort and confirming you are happy with the model. I will put the working excel version through to Richard T.
The GWP per-mass basis in Elrod’s paper and model. Elrod’s GWP equation 3 provenance (IPCC FAR via Seinfeld et al 1998). Simplifications to Elrod 4 by Elrod.for his spreadsheet model. The whole caboodle (GWPs) still all hinges on (are relative too) the initial values for CO2 (set at 1) and the accuracy of CO2 forcing (and therefore “efficiency”) determination (note RF revisions and therefore RE revisions in Myhre et al 1998, and 1998b I think). At least we now have a simple spreadsheet model that can easily produce a number and we can examine the spurious adjustments made to get to the number 23. I agree with you whole heartedly that the whole caboodle of GWP’s is flawed but while it is still recognised by governments it needs attention. The radiative efficiencies ax and ar are not necessarily constant over time. While the absorption of infrared radiation by many greenhouse gases varies linearly with their abundance, a few important ones display non-linear behaviour for current and likely future abundances (e.g., CO2, CH4, and N2O). For those gases, the relative radiative forcing will depend upon abundance and hence upon the future scenario adopted. Since all GWP calculations are a comparison to CO2 which is non-linear, all GWP values are affected. Assuming otherwise as is done above will lead to lower GWPs for other gases than a more detailed approach would. GWP is based on a number of factors, including the radiative efficiency (infrared-absorbing ability) [actually radiative forcing “capacity” below] of each gas relative to that of carbon dioxide, as well as the decay rate of each gas (the amount removed from the atmosphere over a given number of years) relative to that of carbon dioxide. where the subscript i represents an interval of 10 inverse centimeters. Absi represents the integrated infrared absorbance of the sample in that interval, and Fi represents the RF for that interval [actually ΔF, see below]. Here to confuse everyone (well, me anyway) they use the same abbreviated nomenclature (RF) for “radiative forcing”, “radiative forcing capacity” and “change in forcing” in the one equation. Feel free anyone to correct me on all of this. “I propose RFC” for radiative forcing capacity. Something like IRaa for “infrared absorbing ability” would be a better descriptive perhaps, just as a mental aid and to define what’s being talked about in discussion. Anything is better than using RF for everything. Jim McKinlay has sent me version 4 of his GWP model spreadsheet and asks me to make it available here. I’m very pleased to do so. Anybody interested can download the model here from our Downloads folder. Now also available from the sidebar. Isn’t it the Elrod model? Also I get “Not found” at the link above.and at the sidebar. I agree, however I am pretty sure that Dr Elrod will not appreciate this rearrangement of his model being used to show up IPCC manipulation. Your call Richard T.
Jim McKinlay has sent me version 4 of his GWP model spreadsheet and asks me to make it available here. I’m very pleased to do so. The file is now in the right place, and my apologies for the inconvenient 404 errors. Readers can download Jim’s latest model from the sidebar. Jim’s model is an adaptation of Matthew J. Elrod’s “Greenhouse Warming Potential Model” from Greenhouse Warming Potentials from the Infrared Spectroscopy of Atmospheric Gases, Matthew J. Elrod, J. Chem. Educ., 1999, 76 (12), p 1702. DOI: 10.1021/ed076p1702. Publication Date (Web): December 1, 1999. Thanks for your help and advice with this, Jim and RC. Let me know if the citation needs correcting. Bonza RT. The citation’s from the source so I don’t see how there can be any problem and the download links work fine. I’m looking at GWP-modelling-v-4 via Google Docs Jim, so if there’s another sheet other than “Methane 100 yrs” that Docs hasn’t given me can you let me know please. I’ll have to look up the rationale for cumulative adjustments because that’s what cranks up the number, but as of now I haven’t got a clue about it. From my background, alarm bells always go off when I see anything cumulative (as in the NZT7). I had models with different time horizons for testing but removed them as they a just confusing and IPCC has adopted 100years. In the lower table (adjustments removed) you will find that you need to put a half life of 27 years for methane (rather than 7) to get to a GWP of 23. Hence the need to use post calc adjustments. The adjustments described in notes above in some cases are averages of the range of possible numbers quoted as Tar 6 doesn’t exactly say the number adopted. The main problem is the contrivances around a pulse of methane throwing out the natural balance of OH radicals and therefore lengthening its life. And the adjustment is made twice- we can see that by the use of 12.0 in table 6.7 as discussed earlier. Now methane is more or less steady state this has to be corrected. OK I’ve got it all then, thanks Jim. It will take me some time to catch up with your level of understanding of the adjustments because I keep going off on missions (see below) but you’ve given me a head start for what to look for when I do actually get around to the IPCC process in detail. Steady => GWP => GWP (mass) including the need to use half life 27 to get GWP 23. I set Radiative Efficiency CO2 to the AR4 value of 0.00001413 (CH4 is unchanged at 0.00037, Elrod used 0.000011 for CO2) and get GWP CH4 25.8 vs 25 AR4. with up to 40% differences from earlier published results. Based on a variety of radiative transfer codes, they found that uncertainties could be reduced to around 12% with well-constrained experiments. The HFCs studied were HFC-23, HFC-32, HFC-134a and HFC-227ea. Hurley et al. (2005) studied the infrared spectrum and RF of perfluoromethane (CΩF4) and derived a 30% higher GWP value than given in the TAR. The RF calculations for the GWPs for CH4, N2O and halogen-containing well-mixed greenhouse gases employ the simplified formulas given in Ramaswamy et al. (2001; see Table 6.2 of the TAR). I’ve run into a snag in that I can’t load Elrod’s model from his paper into Google Doc’s to get a workable spreadsheet but I have been able to load the data sheet ITS GWP Data. I’ll have to get Excel back up but my computer is bursting at the seems with apps so I’ll have to blow something away. I was going to wait until I get a new machine but that’s on the back burner for a while (sigh). It loads into Google Docs spreadsheet no problem as did the former (bundled) ITS GWP Data so I’m still in the game. Question is: what is the difference between GWP.xls and ITS GWP Data.xls ? Until I get Excel back up I don’t know but if you guys can make a comparison via Excel it would speed up the process. For some reason the blog wont hyperlink the full Elrod Model (unbundled).xls Dropbox address but if you append “.xls” in the browser address box you should be able to get to it (I can). No don’t seem to be able to but If you can see the red box ” replicating cf3ch2f ” which is the unbundling thats fine. Not sure anyone else would be particularly interested. Did you append “,xls” as per my following comment Jim? What you’ve done Jim, is fulfilled Elrod’s objective. In his paper he describes how the model is a learning tool for students to fill in the necessary data and in the process, learn a great deal. By your doing so you’re way ahead of the rest of us (well me anyway but I’m learning too). ITS GWP Data.xls – this is a bare-bones version of gwp.xls and particularly useless – ignore it. GWP-modelling-v-4.xls – this is Jim McKinlay’s very much more useful multipurpose model compiled in a format that demonstrates the sequence of GWP computation that Elrod’s model does not clearly and simply do. Both sections demonstrate how an initial GWP is massively boosted by subsequent adjustments. As accessed, the model will have TAR values e.g Radiative Efficiency CO2 0.01584 but any user can access the latest IPCC values in the most recent Assessment Report and adjust accordingly. Since the sun went quiet and cloud cover consequently increased again, not as much sunshine has got into the oceans, and consequently they have started cooling slightly since 2004. This makes the sea surface has cool down, and since land surface temperatures mimic what the sea surface does a few months later, they have cooled too. But the lower troposphere higher up above the ground has warmed, because the excess energy stored in the oceans while the sun was very active and cloud diminished between 1975 and 2004 is now being emitted back out, warming the atmosphere at cloud level, and from there heading out to space. But how come this energy being emitted into the atmosphere from the oceans isn’t being trapped by the extra co2 and then re-radiated back down to the surface and warming it up? The answer is that it is trying its best, but the effect is much less powerful in relation to the effect of a more active sun in the warming period and a less active sun now, than the warmist theoreticians believed. This is because they didn’t take into account the effect of the active sun causing diminishing cloud cover, and so the sea surface and ground is cooling and the heat is escaping back to space now the sun has become much less active, but is keeping the troposphere at cloud level warm on its way. Josh Willis under the scope at Jo Nova. There are, in fact, a number of engineers working on calibrating, testing, and perfecting the floats — that’s why they work as well as they do. Willis, however, used none of this information in deciding which floats to remove from his data set. According to his own testimony [Hotlinked], his sole criteria for rejecting a float’s data was that it conflicted with his colleagues’s models. He reported no attempt to correlate his rejected floats with any other calibration data. He rejected no floats that were reading suspected anomolously high temperatures — only low temperature ones. His goal, pure and simple, was to get the ‘right’ answer (coincidentally, I’m sure, also the answer that would most likely get him follow-on grants), whatever he had to do to the data to get there. Phase transitions of atmospheric water play a ubiquitous role in the Earth’s climate system, but their direct impact on atmospheric dynamics has escaped wide attention. Here we examine and advance a theory as to how condensation influences atmospheric pressure through the mass removal of water from the gas phase with a simultaneous account of the latent heat release. Building from fundamental physical principles we show that condensation is associated with a decline in air pressure in the lower atmosphere. This decline occurs up to a certain height, which ranges from 3 to 4 km for surface temperatures from 10 to 30 C. We then estimate the horizontal pressure differences associated with water vapor condensation and find that these are comparable in magnitude with the pressure differences driving observed circulation patterns. The water vapor delivered to the atmosphere via evaporation represents a store of potential energy available to accelerate air and thus drive winds. Our estimates suggest that the global mean power at which this potential energy is released by condensation is around one per cent of the global solar power – this is similar to the known stationary dissipative power of general atmospheric circulation. We conclude that condensation and evaporation merit attention as major, if previously overlooked, factors in driving atmospheric dynamics. There is indeed some correlation in the data from 1988 until 1998, but thereafter the two trends diverge dramatically. Total atmospheric water content actually falls despite a relentless slow rise in CO2. This fall in atmospheric H2O also coincides with the observed stalling of global temperatures for the last 16 years. All climate models (that I am aware of} predict exactly the opposite. Something is clearly amiss with theory. Is it not now time for “consensus” scientists to have a rethink? […] As of now, the Southwestern United States is threatened with a heat wave and for good reason: there is not enough water vapor present in the air to keep the temperature down. Take a look at this snapshot of the distribution of water vapor over North America taken June 27th. Climatology textbooks also explain why. “The most common atmospheric adiabatic phenomena are those involving the change of air temperature due to change of pressure. If an air mass has its pressure decreased, it will expand and do mechanical work on the surrounding air . . . the energy required to do work is taken from the heat energy of the air mass, resulting in a temperature decrease. When pressure is increased, the work done on the air mass appears as heat, causing its temperature to rise. The rates of adiabatic heating and cooling in the atmosphere are described as lapse rates and are expressed as the change of temperature with height. The adiabatic lapse rate for dry air is very nearly 1 °C per 100 m.
As the air descends in both locations, “the work done on the air mass appears as heat”, but in the more humid climate a portion of that work energy is diverted to keeping the water vaporized, i.e., it turns into “latent heat” and “latent heat” does not raise the air’s temperature. 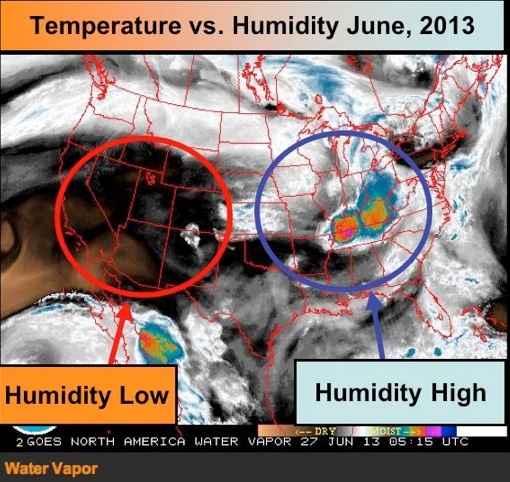 Thus standard Climatology explains why heat waves only occur during times of low humidity, as is the current situation in the Southwestern United States. I understand that this runs counter to the “greenhouse effect” hypothesis, which asserts that water vapor “traps” heat in the air and therefore the more humid climate should be the warmer climate, but science is not about what might be a popular belief at any particular point in time, rather it is about what is seen to happen in the real world. When there’s a flood we are told that it is because the air holds more water vapour in a “warmer world”. When there’s a heat wave or a drought we don’t hear about that but only that it is because it’s a “warmer world”. Good news! The 2013 Southwestern US heat wave has been cancelled because a deluge of water vapor has moved into the region and cooled everything down. This, of course, is opposite what the “greenhouse effect” hypothesis predicts. It asserts that water vapor is a “heat trapping gas” that is suppose to cause at least 22 degrees C (40 degrees F) of atmospheric warming. Here are a just a few statements that conflict with the above empirical observation that water vapor actually cools rather than warms surface level air. “Water vapor is known to be Earth’s most abundant greenhouse gas . . . Increasing water vapor leads to warmer temperatures. Water vapor is an important greenhouse gas in the earth’s atmosphere. Absorption of the solar radiation by water vapor in the near UV region may partially account for the up to 30% discrepancy between the modeled and the observed solar energy absorbed by the atmosphere. But the magnitude of water vapor absorption in the near UV region at wavelengths shorter than 384 nm is not known. We have determined absorption cross sections of water vapor at 5 nm intervals in the 290-350 nm region, by using cavity ring-down spectroscopy. Water vapor cross section values range from 2.94 × 10-24 to 2.13 × 10-25 cm2/molecule in the wavelength region studied. The effect of the water vapor absorption in the 290-350 nm region on the modeledradiation flux at the ground level has been evaluated using radiative transfer model. “The new climate orthodoxy: if you question the work of Mike Mann, you must be a “denier”. At least it has the virtue of simplicity. Nothing could have prepared Ivan Macfadyen for the devastation all around him as he sailed the Pacific. ”Part of it was the aftermath of the tsunami that hit Japan a couple of years ago. The wave came in over the land, picked up an unbelievable load of stuff and carried it out to sea. And it’s still out there, everywhere you look,” Macfadyen says. His brother Glenn, who boarded at Hawaii for the run into the US, marvelled at the ”thousands on thousands” of yellow plastic buoys. The huge tangles of synthetic rope, fishing lines and nets. Pieces of polystyrene foam by the million. And slicks of oil and petrol, everywhere. Countless hundreds of wooden power poles are out there, snapped off by the killer wave and still trailing wires in the middle of the sea. On other voyages, when their boat was becalmed, the Macfadyens would just crank the motor and chug off. Not this time. Then it’s back to GHGs again for post 1998. Can’t wait to find out what these guys discover in the next sixteen years. About time these question were asked, and we all know the ramifications the answers will have. Magoo, this is a spectacular development. I’m elevating your comment and link to a post so it’s more visible and hope to have time for more comments on it soon. Thank you! Hansen et al (2005) have an estimate for planetary oceanic thermal inertia (as do others in the literature). Mostly citing the above-linked Science study by Hansen et al Earth’s thermal climate inertia is often quoted as being ’40 years’ [“10 -100 years” – Trenberth]. The study [Hansen et al 2005 – see link in article] says something quite different though. It offers a confidence range between 25 and 50 years – with 37.5 years as most likely value. I think this is a very realistic estimate, it is longer than some others e.g. Abdussamatov’s 20 yr ocean-only and 14+/-6 land+ocean, and certainly a lot longer than “time constant” experts from other fields (think Electrical Engineers and David Evans N-D Solar Model series – many heated arguments over the oceanic time constant). For example, solar change occurred circa 2005 and is continuing. Using Hansen et al’s lag time estimate, we should start looking for a temperature response in the atmosphere starting around 2030. In other words, the acid test for the alternative solar conjecture DOES NOT EVEN BEGIN until 2030 according to Hansen et al (2005), contrary to most IPCC solar specialists and thermodynamic illiterates like John Cook’s Skeptical Science blog who demand an almost instantaneous atmospheric temperature response to solar change. For what it’s worth (probably nothing), I’m inclined to start looking for a temperature response to solar change over the 2020s i.e. a lag time stating at 20 yrs gives 2005 + 20 = 2025, a little sooner than Hansen et al imply.